Middlewich Clean Team have received £100 grant from Tescos as part of their Community Champions project. The cheque was presented to Stephen Dent at their Middlewich store on 20th June 2010. We would like to thank Tesco for their support. On Saturday 12the June the Middlewich Clean Team was joined by our newest member. Chairperson, Janet Chisholm commented, 'Firstly can I welcome our newest Clean Team Member Fiona Bruce (our local Member of Parliament) who joined the litter pick which was held on Saturday. Fiona is very encouraging and it was a fantastic opportunity to discuss the aims and objectives of our dedicated group, which is now in its eighth year. We collected six bags of rubbish which I believe have already been removed by our Streetscape Team. Please pass on our thanks Charlie [at Streetscape]'. Fiona Bruce MP follows up with a visit to parliament and a press release. 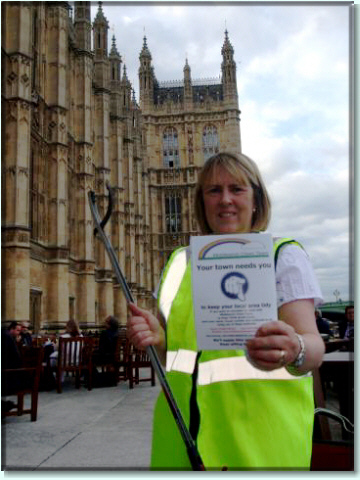 Middlewich Clean Team Chairperson, Janet Chisholm commented, ' As you can see Fiona, good as her word, took the litter picker and tabard + the Go Local advert to the House of Commons'. The full press release is in this document 'Fiona Bruce MP becomes member of Middlewich Clean Team' which requires Adobe Reader to be installed on your computer. If you do not have Adobe Reader installed on your computer you can get it here.